The Golden Rose Stakes is a Group 1 weight-for-age contest for three-year-old horses that runs as the second Group 1 race during the Sydney Spring Racing Carnival following Randwick’s George Main Stakes a week before. The Golden Rose is the first Group 1 event for three-year-olds every racing season and can be a key form reference for the Caulfield Guineas, Thousand Guineas and Coolmore Stud Stakes later in the Spring Racing Carnival down in Melbourne. The Golden Rose has only been a Group 1 event since 2009, but the honour roll already includes some genuine turf stars including Toorak Toff (2010), Zoustar (2013) and Exosphere (2015). This year the Golden Rose runs on Saturday September 22, 2018. The Golden Rose Stakes betting markets are traditionally led by the in-form three-year-olds of the season with winning lead-up form from earlier in the Sydney Spring Racing Carnival. Horses that ran well in the top juvenile features of the season prior, like the Golden Slipper Stakes, often sit high up the pre-nomination Golden Rose odds. Fillies can be found at longer odds each season as they have a poor record in the race against the boys, Forensics (2008) the last to salute. The fillies do have a solid place record in the event however including in 2017 when Champagne Cuddles finished runner-up to the upset Golden Rose winner Trapeze Artist. Favourites in Golden Rose markets have a gun recent record having won back-to-back for trainer John O’Shea in 2015 (Exosphere) and Astern (2016). Prior to that the last punters’ picks to win were Duporth (2008) and Denman (2009). In the time between though, only one Golden Rose winner jumped at double-digits with Epaulette ($13 in 2012). In 2017 however Trapeze Artist stole the show at a blowout price of $41 in Golden Rose betting, that year’s favourite being his stablemate Menari ($2.35) who finished third. The latest Golden Rose Stakes 2018 betting odds will be provided below once out, so bookmark this page to access the top spring Group 1 racing prices on your Golden Rose selections. 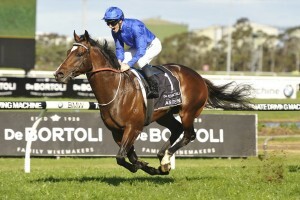 The Golden Rose Stakes field was released on Monday September 18. The $1 million race will feature the likes of Kris Lees’ Group 3 San Domenico Stakes (1100m) winner Graff and Chris Waller’s Group 2 Run to the Rose (1200m) winner Lean Mean Machine. New season three-year-olds contesting the Golden Rose field traditionally come off a lead-up run in the Group 2 Run To The Rose (1200m) held at the same track a fortnight earlier. From 2012 – 2016 all five Golden Rose winners were Run To The Rose graduates, including Hallowed Crown (2014), Exosphere (2015) and Astern (2016) who completed the double three years on the trot. Astern (2016) was the last favourite in Golden Rose Stakes betting to salute for the punters. Photo Credit: Steve Hart. The official Golden Rose Stakes 2018 Final Field & Barriers are set for release at 9:00am (local) on Wednesday September 20, 2017 and will be published in full below so stay tuned to see the three-year-old gallopers that line-up in the million dollar spring feature. The early nominations close at 11:00am (AEST) on Monday September 18, 2018 . The full list of entries can be seen below. The Golden Rose Stakes is one of the most highly anticipated events during the Sydney Spring Racing Carnival and because of this the majority of racing experts have a set of Golden Rose Stakes tips every year. Horses generally come from both Sydney and Melbourne to contest the race and there are often plenty of different form lines converging in the Group 1 event. Key Golden Rose Stakes tips include looking for horses that won their lead-up race with six of the nine winners from 2009 – 2017 having taken out their final race before the Group 1. The Run To The Rose has provided more Golden Rose champions in the past decade than any other race, so a top tip is to back the best out of that Group 2 held two weeks prior to Golden Rose Stakes Day. Also, avoiding the fillies in the Golden Rose Stakes betting tips has proven successful historically with Forensics (2008) the only filly to beat the boys in the race since Dandify (2000). Our Ladbrokes’ exclusive Golden Rose Stakes 2018 betting tips will be detailed below the week of the race so stay tuned for the three-year-olds to back and sack in the Rosehill showdown this September. The Stakes form guide is highly sought after heading into the Group 1 event and is key reading to find the winner of the race. The Run To The Rose is the major lead-up to the Golden Rose and it has produced more winners than any other preparatory run, but the Up And Coming Stakes. The Form Guide provided all the need-to-know race info including the lead-up form of the runners, their saddle-cloth numbers, jockeys and trainers, and the barriers. From 2013 – 2017 four of the five winners had a wide Golden Slipper Stakes barrier draw including Trapeze Artist (14 of 14), so backing a wider-drawn runner can prove a good bet. The Golden Rose Stakes results of the past 30 years have been dominated by the colts and geldings with the only successful fillies in the spring feature since 1997 being Dandify (2000) and Forensics (2008). Recent Golden Rose history shows horses under $10 in betting having the best record, while from 2008 – 2017 four Golden Rose betting favourites saluted for the punters. The official Golden Rose Stakes 2018 Results & Finishing Order will be published in full below once the race is run and won on Saturday September 22, 2018. GVC Australia Pty Ltd | ABN 25 151 956 768. Copyright © 2013-2015. We are licensed and regulated by an Australian Territory, and secured using Secure Sockets Layer with 2048-bit encryption. Promotion Terms *WA, NSW, VIC and SA residents are ineligible to participate in promotions and offers. See Promotional Terms and Conditions.